Millions of people have seen Franklin Lischke running naked, but he didn't mind at all. In fact, Lischke was proud of the fact that as a boy, he frequently modeled for Norman Rockwell, the legendary artist of American life in the 20th century. Rockwell posed young Frank for many of his 321 Saturday Evening Post covers, including the famous scene of three skinny-dipping boys, clothes in hand, running by a “No Swimming” sign as they flee the law. It was painted in 1921. “I still remember the day I posed for it and how I would sit there and have my legs propped up with books” to simulate running, Lischke told the Associated Press in 1991. Besides having great eyebrow movement, Lischke was convenient. 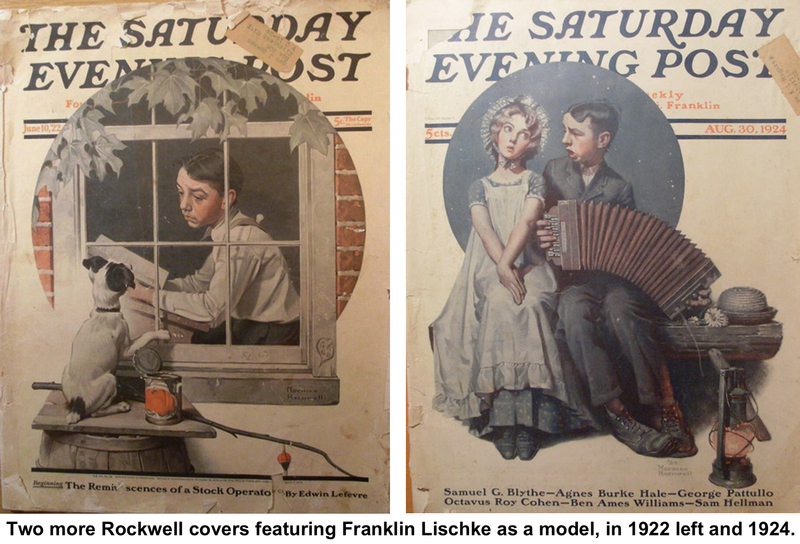 Rockwell in the 1920s rented studio space from the Lischke family in New Rochelle, N.Y.
Lischke himself was paid the then-princely sum of 50 cents an hour (about $6.70 in 2016) to model. He later got a raise to 75 cents and was eventually hired as Rockwell’s “studio boy” at $5 a week. 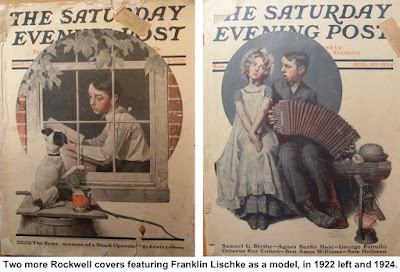 Lischke, who was 13 when he posed for the “No Swimming” cover, continued to model for Rockwell until he was 17 when he became “too old to be a kid model and not good-looking enough to be an Arrow Collar Man,” he said. 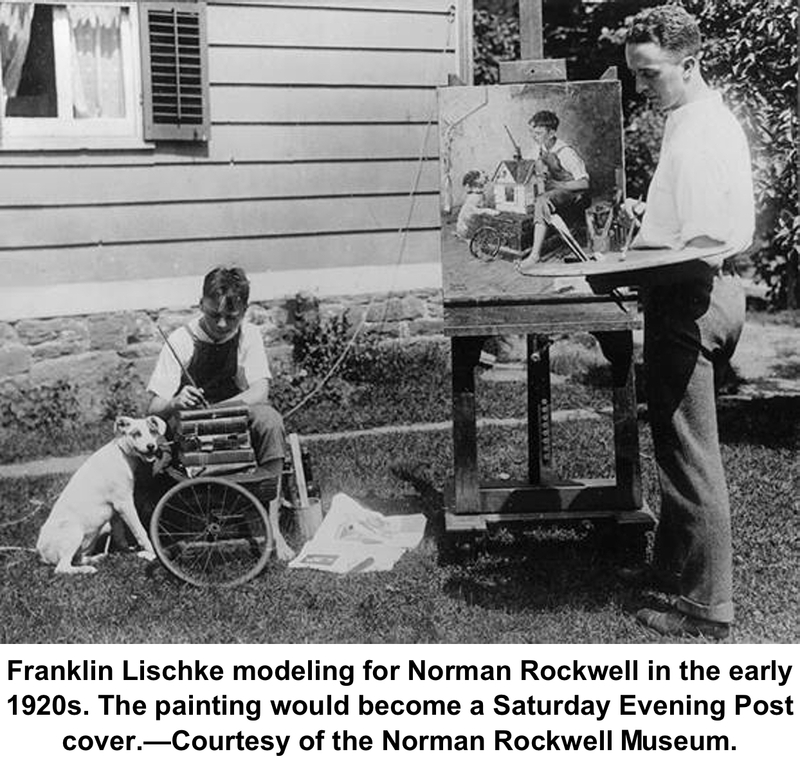 Rockwell, who became a lifelong friend, urged the young Lischke to pursue art as a career, and he did. He became a well-known commercial artist in New York City, specializing in fashion work for stores like Bloomingdale’s, Saks, and Bonwit Teller. 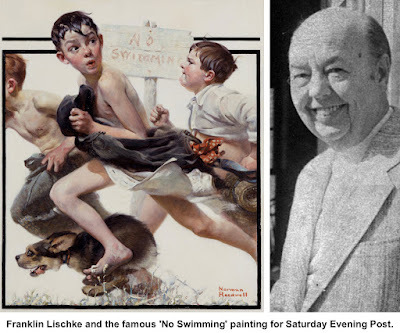 Franklin H. Lische was born in 1908 in New Rochelle (where Frederic Remington also had his studio before moving to Ridgefield). He wound up studying at the Art Students’ League under a man who had taught Rockwell, George Bridgeman. While living in Ridgefield from 1946 to 1986, Lischke maintained a studio in New York City to work as a freelance commercial artist. In Ridgefield, he used his talents to contribute to the community, doing many of the illustrations for Silvio Bedini's 1958 history, “Ridgefield in Review,” the Bicentennial commemorative book, “Heritage '76,” and the 1975 history of St. Stephen's Church, where he served on many parish committees. He also designed graphics and did art for the Keeler Tavern, the Ridgefield Library, the Ridgefield Garden Club, and the Ridgefield Orchestra. In 1986, he retired and with his wife, Martha, moved to Litchfield, where he died in 1991 at the age of 83. One of Lischke’s favorite childhood stories involved how he addressed his boss. “I remember going to the studio when I was 13 or 14 years old,” he told the Litchfield paper. “I always called him Mr. Rockwell, and one day he said to me, ‘Frank, you don’t have to call me Mr. Rockwell.’ Well, I couldn’t very well call him Norman, so he said, ‘Call me Bosco.’ I don’t know where that came from.